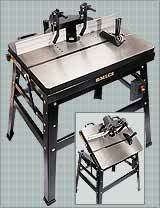 MLCS has many different router table styles with one thing in common: Free Shipping! The Horizonal Table routs wide stock FLAT ON THE TABLE with tall bits horizontal. Don't stand stock on edge! 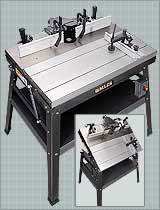 Tilting Top cuts custom chamfers & angles that can't be cut on a 90° top. Mortising Top slides on T-tracks to cut mortise and tenon joinery. 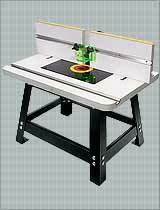 The Cast-Iron Router Table features a 24" x 32" surface area. Compatible with all MLCS lifts and plates. 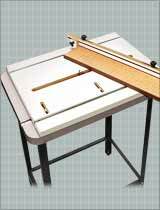 The Router Table Top features a 24" x 32" melamine tabletop, choice of router insert plates and a high split fence. 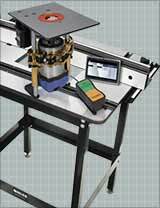 The Precision Table is cast-iron, extruded aluminum and steel with a Tilt-Up sliding top, & clamping system. The Heavyweight Table features a Cast Iron Tilt-Up top with split fence, power switch, and miter gauge. 120 lbs! 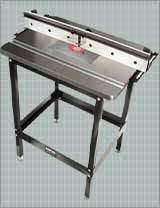 The Cast-Iron Extension Table replaces extension wings on your table saw. Cast-iron top with choice of router insert plate. 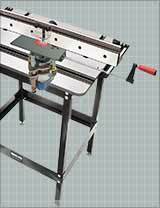 The Extension Router Table Top mounts left or right side on table saw. Melamine top, phenolic or aluminum plate with a high split fence. 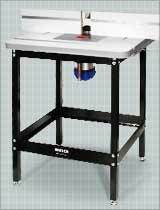 The Ultimate PowerLift Pro® Table System features the PowerLift Pro®, X1 Fence, Phenolic Table Top, 3‑1/4 HP Router Motor, Premium Router Plate and our Pro Stand. The Ultimate U-Turn Table System features the U‑Turn Router Lift®, X1 Fence, Phenolic Table Top, 3‑1/4 HP Router Motor, Premium Router Plate and our Pro Stand. 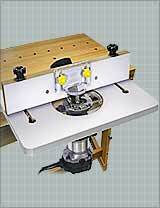 The Bench Top Router Table heavy gauge steel stand is mounted to a table top with split fence and dust port. Router insert included. 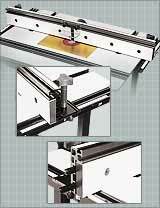 Screw or clamp to any surface! 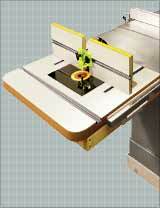 The Mini Trim Table is designed to work with the Rocky 30 router. Includes a router plate, fence and dust port. 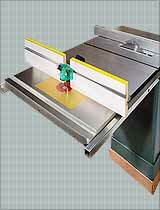 Phenolic Router Table Tops are known for strength and stability. Available with Standard and the "X1" Fences. 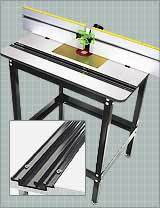 The "X1" Fence is a major upgrade to almost any router table, featuring a two track mounting system, two space bars and smooth action. 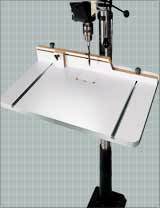 MLCS Drill Press Table adds versatility and precision to your drill press at a great price. 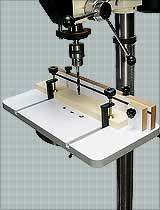 The Jumbo Drill Press Table fence design gives additional handle clearance. 20" x 30" table top with fence. 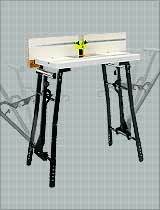 The Adjustable Roller Support Tool Stand has three roller positions. Solid steel construction provides level support for in/outfeed operations. 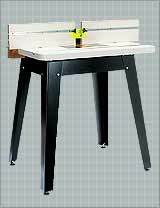 The Heavy Duty Tool Stand features solid steel construction and sturdy splayed steel legs with adjustable rubber feet. 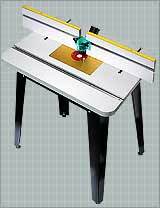 The Pro Router Table Stand is designed to work with the U-Turn Router Lift but also works with all MLCS Router Table tops. 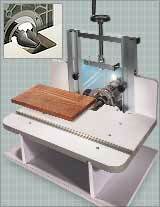 The Router Table Crosscut Sled precisely routs dadoes or rabbets, up to 45° angles. Adjustable Stop Block is included with the fence.